For other people named Joe or Joseph Davis, see Joe Davis (disambiguation). Joseph Davis, OBE (15 April 1901 – 10 July 1978) was an English professional snooker and English billiards player. He was the dominant figure in snooker from the 1920s to the 1950s. He won the first 15 World Championships from 1927 to 1946. Snooker is a cue sport which originated among British Army officers stationed in India in the later half of the 19th century. It is played on a rectangular table covered with a green cloth, or baize, with pockets at each of the four corners and in the middle of each long side. Using a cue and 21 coloured balls, players must strike the white ball to pot the remaining balls in the correct sequence, accumulating points for each pot. An individual game, or frame, is won by the player scoring the most points. A match is won when a player wins a predetermined number of frames. English billiards, called simply billiards in the United Kingdom, where it originated, and in many former British colonies such as Australia, is a cue sport that combines the aspects of carom billiards and pocket billiards. Two cue balls and a red object ball are used. Each player or team uses a different cue ball. It is played on a billiards table with the same dimensions as a snooker table and points are scored for cannons and pocketing the balls. English billiards has also, but less frequently, been referred to as "the English game", "the all-in game" and (formerly) "the common game". The World Snooker Championship is the leading snooker tournament both in terms of prestige and prize money. The first championship was held in 1927 and was won by Joe Davis. Davis won the first 15 championships before retiring from the event, undefeated, after his 1946 success. In the 1950s snooker went into a period of decline and the championship was not held after 1952, although an unofficial championship was held until 1957. In 1964 the championship was revived on a challenge basis and in 1969 the championship became a knock-out event again. Since 1977 it has been played at the Crucible Theatre in Sheffield, England. The tournament is currently played over 17 days and ends on the first Monday in May. In the modern era, the best record is that of Stephen Hendry, who won the title seven times. Steve Davis and Ray Reardon both won six times while Ronnie O'Sullivan has won five titles. The current champion is Mark Williams, who has won the tournament three times. After his 1946 victory he no longer played in the World Championship but continued to play in other tournaments and exhibition matches until the late 1950s. He was World Billiards Champion 4 times between 1928 and 1932. Joe Davis became a professional billiards player at the age of 18, having won the Chesterfield Championship at age 13. In 1926 he reached his first World Professional Billiards Championship final but was unsuccessful against defending champion Tom Newman. He reached the final again the following year and was runner-up again to the same opponent. It was to be a case of third time lucky for Davis when he defeated Newman in 1928 to become the world champion at English billiards for the first time. He would defend his title for the next three years – against Newman again in 1929 and 1930 and New Zealander Clark McConachy in 1932. He contested the final two more times in 1933 and 1934 losing on both occasions to Australian Walter Lindrum. Tom Newman was an English professional player of English billiards and snooker. He was born Thomas Edgar Pratt in Barton-on-Humber, Lincolnshire. 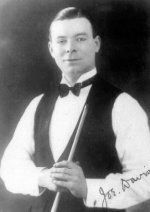 He always appeared under the name Tom Newman when playing billiards or snooker and changed his name formally in 1919, shortly before his marriage that year. Clark McConachy,, often known simply as Mac, was a New Zealand professional player of English billiards and snooker. Walter Albert Lindrum, OBE, often known as Wally Lindrum, was an Australian professional player of English billiards who held the World Professional Billiards Championship from 1933 until his retirement in 1950. Being the first Lindrum born in Western Australia, he was named Walter Albert to have the initials of the state where he was born. He was one of the most successful players ever seen in billiards, with 57 world records to his credit, some of which still stand. Coinciding with his peak as a billiards player, Davis's interests shifted to snooker and he helped to organise the first snooker world championship in 1927 and won the tournament by beating Tom Dennis, for which he won UK£6 10s. He went on to win the world championship every year until 1940. Joe's brother Fred, twelve years his junior, was also a snooker player and multiple World Champion. When Joe met Fred in the world championship final of 1940, Joe won 37–36. The 1927 World Snooker Championship was a snooker tournament held at various venues throughout the season. This was the inaugural edition of the tournament and was organised by Joe Davis and Bill Camkin. The final took place at the Camkin's Hall in Birmingham, England with Joe Davis winning the title by defeating Tom Dennis. Originally called the Professional Snooker Championship, it did not become the World Championship until 1935. Thomas Arthur Dennis was an English professional snooker and English billiards player. Following the outbreak of World War II the world championship was not held for the next five years. On resumption in 1946, Davis defended his title making it his 15th consecutive win and thereby holding the title for 20 straight years. To date, he has won more world championships than any other player. He retired from the event following this victory making him the only undefeated player in the history of the world championships. The News of the World Snooker Tournament was one of the leading professional tournaments of the 1950s and widely considered as being more important than the world championship due to the involvement of Joe Davis. The event was sponsored by the Sunday newspaper News of the World. The highest break of the tournament was four times 140 or more, which was unusual at that time. Herbert John Pulman was an English professional snooker player who dominated the game throughout the 1960s. In snooker the maximum break is 147, also known as a maximum, a 147, or orally, a one-four-seven. A player compiles a maximum break by potting all 15 reds with 15 blacks for 120 points, followed by all six colours for a further 27 points. A maximum break is regarded as the highest possible achievement in a single frame of snooker, and is often compared to a nine-dart finish in darts or a 300 game in ten-pin bowling. Davis was awarded the Order of the British Empire (OBE) in 1963. He continued to play professionally until 1964. Davis died two months after collapsing while watching his brother play Perrie Mans in the 1978 World Snooker Championship semi-final. His home, in Whitwell, Derbyshire bears a plaque commemorating him. Until the 1980s, he was still generally regarded as the best player in the history of his sport, a sentiment demonstrated by the snooker coach Frank Callan, who, in his book "Frank Callan's Snooker Clinic", compared the best player at the time, Steve Davis, to Joe Davis in order to determine the greatest player ever. Callan also stated that, "many players who tried to emulate Joe's stance (which was unusually off centre due to left eye striking) simply gave up the game when they found they couldn't play like that". Davis' influence on the game was such that, according to Callan, "his word was law". Desmond Rex Williams is a retired English professional snooker and billiards player. Williams was an excellent junior player in both snooker and billiards, and a three time World Snooker Championship semi-finalist. Walter Weir Wilson Donaldson was a Scottish professional snooker and billiards player. Horace Lindrum was an Australian professional snooker and billiards player. The dominant snooker player in Australia, he lived in Britain for long periods and played in the major British tournaments. From his arrival in Britain in 1935 he was regarded as the second best player in the world, behind Joe Davis. Lindrum contested three World Championship finals against Davis, in 1936, 1937 and 1946, losing all three to Davis but coming close to beating him on several occasions. When past his best, Lindrum won the 1952 World Championship which, because of a dispute between the governing body and the players' association, was only contested by himself and New Zealander Clark McConachy. With the agreement of the Billiards Association and Control Council the World Snooker Championship was revived by Rex Williams on a challenge basis after a six-year absence in 1964. The 1957 World Champion John Pulman played seven challenge matches against various opponents in the next five years, until the tournament reverted to a knock-out tournament in 1969. John Joseph 'Jackie' Rea was a Northern Irish snooker player. He was the leading Irish snooker player until the emergence of Alex Higgins. The 1928 World Snooker Championship was a snooker tournament held at various venues throughout the season. The final was held at the Camkin's Hall in Birmingham, England. It was played on a challenge basis with the other 6 entries, playing off for the right to challenge Joe Davis in the final. The highest break of the tournament was 46 made by Alec Mann. Fred Davis, was an English professional player of snooker and billiards, one of only two players ever to win the world title in both, the other being his brother Joe. He was one of the most popular personalities in the game, with a professional career which lasted from 1929 to 1993. He was an 8-time World Snooker Champion. The 1947 World Snooker Championship was a professional snooker tournament. The final was held at the Leicester Square Hall in London, England from 13 to 25 October. The semi-finals had been completed on 15 March but the finalists agreed to delay the final until the autumn so that it could be played at the rebuilt Thurston's Hall which had been bombed in October 1940. The 1954 World Professional Match-play Championship was a snooker tournament. The final was held at the Houldsworth Hall in Manchester, England. The 1955 World Professional Match-play Championship was a professional snooker tournament, the final being held at the Tower Circus in Blackpool from 14 to 19 March 1955. The entries did not include Walter Donaldson who, after his heavy defeat in the 1954 final, had joined Joe Davis in "retiring" from the Championship. The 1956 World Professional Match-play Championship was a snooker tournament with the final being held at the Tower Circus in Blackpool, England. Fred Davis won his eighth and last World title by defeating John Pulman 38–35 in the 73-frame final. Pulman led 31–29 but Davis won 8 of the first 10 frames on the final day to take a winning lead of 37–33. The 1957 World Professional Match-play Championship was a snooker tournament held from 1 to 13 April in Saint Helier, Jersey. This was the first time the final was held outside England. The World Championship was not held again until 1964. John Pulman won his first world title by defeating Jackie Rea 39–34 in the 73-frame final. Rea led in the early stages but Pulman pulled ahead and took a winning lead of 37–29 after the final afternoon session. Sydney Lee was an English professional billiards and snooker player. He was four times a quarter-finalist in the World Snooker Championship during the first half of the twentieth century. He was a snooker referee on Pot Black. He was the game consultant for a 1970 episode of Steptoe and Son entitled "Pot Black" and, as well as performing a number of trick shots was the stand-in for many of the more difficult regular shots seen in the show. The 1959 News of the World Snooker Plus Tournament was a professional snooker tournament sponsored by the News of the World. The event was played under the Snooker Plus rules, a variant of snooker with two additional colours. The tournament was won by Joe Davis with Fred Davis finishing in second place. It was the eleventh and final News of the World Tournament, which ran from 1949/50 to 1959. The 1951/1952 News of the World Snooker Tournament was a professional snooker tournament sponsored by the News of the World. The tournament was won by Sidney Smith who won 6 of his 8 matches. He finished ahead of Albert Brown who also won 6 matches but won one fewer frame overall. The News of the World Snooker Tournament ran from 1949/50 to 1959. The 1954/1955 News of the World Snooker Tournament was a professional snooker tournament sponsored by the News of the World. The tournament was won by Jackie Rea who won all of 8 matches. He finished ahead of Joe Davis who won 6 matches. The News of the World Snooker Tournament ran from 1949/50 to 1959 but this was the last to be held at Leicester Square Hall, which closed soon after the end of the tournament. The 1950/1951 News of the World Snooker Tournament was a professional snooker tournament sponsored by the News of the World. The tournament was won by Alec Brown who won all his 7 matches, finishing ahead of John Pulman who won 5 matches. The News of the World Snooker Tournament ran from 1949/50 to 1959. 1 2 Turner, Chris. "Player Profile – Joe Davis OBE". Chris Turner's Snooker Archive. Archived from the original on 10 May 2012. Retrieved 15 June 2011. 1 2 "Betfred.com World Championship – History". World Snooker. World Professional Billiards and Snooker Association. 2 March 2011. Retrieved 14 November 2011. ↑ "Snooker Gold Cup won by Davis". Morning Bulletin. 21 December 1936. Retrieved 17 October 2012. ↑ Hayton, Eric (2004). The CueSport Book of Professional Snooker. Suffolk: Rose Villa Publications. p. 4. ISBN 978-0-9548549-0-4. Davis, Joe (1976). The Breaks Came My Way – Autobiography. W. H. Allen. ISBN 0-491-01686-7 . Retrieved 9 September 2009. Wikimedia Commons has media related to Joe Davis .